Masahiro Abe is Professor of Department of Hematology, Endocrinology and Metabolism at Tokushima University Graduate School, and Chief of Division of Hematology at Tokushima University Hospital. He graduated from Tokushima University School of Medicine, Japan, in 1984. In 1989-92, he studied the biology of multiple myeloma and AL amyloidosis as a visiting scientist at Human Immunology and Cancer Program at University of Tennessee Medical Center. He became Clinical Professor of Tokushima University Hospital in 2009, and then Professor of Tokushima University Graduate School in 2015. He has been studying to dissect the molecular mechanisms for formation of bone disease in myeloma and drug resistance in myeloma cells and their progenitors, and trying to develop innovative therapeutic strategies against myeloma and its bone disease. He is currently a Council member of the JBMM and Japanese Society of Myeloma. Philippe Clezardin is Research Director at INSERM (National Institute for Medical Research), head of the Research Unit UMR_S1033 entitled: “Pathophysiology, Diagnostic and Treatments of Bone Diseases” (http://www.lyos.fr/; 2011-present), and Coordinator of the european Marie Curie Initial Training Network BONE-NET (2011-2015). He is also Associate Editor of BoneKEy Reports (Nature Publishing Group) and the Journal of Bone Oncology (Elsevier). Before that he was Director of the Federative Research Institute “IFR62” entitled: “Cancer, Nutrition and Metabolism” (14 laboratories, circa: 500 people; 2007-2010) and President of the Cancer and Bone Society (2009-2010). He is member of several scientific societies [American Association for Bone and Mineral Research (ASBMR), American Association for Cancer Research (AACR), Association pour la Recherche sur les Tumeurs de la Prostate (ARTP), International Bone and Mineral Society (IBMS), Société Française du Cancer (SFC), European Study Group of Bone Metastasis (GEMO)]. For the past twenty years, Philippe focused his research interests on the mechanisms of bone metastasis formation of breast and prostate cancers, with the goal of developing new anticancer therapies. He obtained his Ph.D and D.Sc. from the University of Lyon, France. He also completed a postdoctoral fellowship at the Medical Research Council in Edinburgh, Scotland, UK (1984-1986) and was a visiting scientist at the Ottawa General Hospital, ON, Canada (1990-1991). Philippe has authored over 130 publications and contributed to about 15 chapters in textbooks on cancer research (h-index: 43). Some of his publications in Cancer Research, Clinical Cancer Research, JNCI, JCI and PNAS have been ranked by the ISI Web of Science among the most highly cited papers. Professor Robert (Rob) Coleman is the Yorkshire Cancer Research Professor of Medical Oncology and Honorary Consultant in the Academic Unit of Clinical Oncology at Weston Park Hospital, Sheffield. He graduated in medicine from Kings College Hospital Medical School in 1978 and trained in London and Edinburgh before moving to Sheffield in 1991. Throughout the past 25 years he has been instrumental in developing clinical cancer research in the city and surrounding clinical network and developing the internationally respected bone oncology research team in Sheffield. He has held many leadership roles within the university and the National Institute for Health Research (NIHR) Cancer Research Network. Since 2014 he has been a part-time Medical Director for the independent medical education provider, prIME Oncology™ alongside his ongoing, but now part-time role within the university. Rob is passionate about improving the care of cancer patients through research and has particular interests in new developments in the management of breast cancer and the effects of cancer and its various treatments on the bones. He has written more than 400 scientific articles and book chapters and leads a number of national and international clinical trials. He is a past-president of CABS and is founding editor of “Journal of Bone Oncology”, the only journal devoted entirely to cancer and bone and is a trustee for Breast Cancer Now, the largest breast cancer research charity in the UK. Cyrille B. Confavreux, MD PhD, is Professor and Chair of Rheumatology at the University Claude Bernard Lyon I, and is currently leading the Department of Rheumatology South and the Bone Metastases Expert Center of Hospices Civils de Lyon, the second teaching Hospital in France. With a physician network involved in bone metastases, he has set up a weekly multidisciplinary concertation meeting to promote bone health and define a personalized care program for each complex bone metastatic patient. He coordinates the “Lung Cancer Bone Metastasis Guidelines of the French South East Region”. He belongs to the board of European Study Group of Bone Metastases (GEMO), is a member of the Bone and Cancer Working Group of the International Osteoporosis Foundation (IOF) and a member of the American Society of Bone and Mineral Research (ASBMR). He conducts research in Dr Clezardin’s INSERM research Lab (UMR 1033) on bone metastases and bone endocrine physiology. He is currently developing biomechanical and numerical simulation tools to evaluate fracture risk of bone mets in vivo and in humans with INSERM (Dr Follet) and IFFSTAR (Dr Mitton) group. Peter undertook his undergraduate and PhD training at the University College Cardiff and the University of Wales College of Medicine. He did post-doctoral training in the Department of Medicine and LMB in Cambridge before moving to the Department of Human Metabolism and Clinical Biochemistry in Sheffield where he became a Leukeamia Research Fund Bennett Senior Research Fellow. In 2001 he moved to the Institute of Musculoskeletal Sciences at Oxford University as a Senior Research Fellow. Peter returned to Sheffield in 2003 as Professor of Bone Biology. In 2009 Peter was appointed the inaugural joint Direct of the Mellanby Center for Bone Research and the Head of the Department of Human Metabolism, at the University of Sheffield. Peter joined the Garvan Institute in December 2011 as Head of the Osteoporosis and Bone Program and now leads the Division of Bone Biology. Peter’s research interests are in understanding the cellular and molecular mechanisms responsible for physiological and pathological regulation of the skeleton. He has a particular interest in tumors that grow in bone such as multiple myeloma, or those that metastasise to bone, including prostate and breast cancer. His current interests are focused on the understanding the earliest critical events in tumor cell colonization of bone, tumor dormancy in the skeleton and the development of therapeutic approaches aimed at targeting the bone microenvironment to prevent tumor growth. Peter is also interested in the development of anti-resorptive and bone anabolic agents to treat tumor induced bone disease. Dr. Claire Edwards is an Associate Professor of Bone Oncology at the University of Oxford where she leads a research group focused upon the pathogenesis of cancer-induced bone disease. Specific interests include the contributions of the host bone marrow microenvironment and the role of obesity, adipocytes and adipokines. Dr. Theresa A. Guise is the Jerry and Peggy Throgmartin Professor of Oncology, Medicine and Pharmacology at the Indiana School of Medicine where she directs a basic and translational research program on the effects of cancer and cancer treatment on muscle and bone. She trained at the University of Pittsburgh and the University of Texas Health Science Center at San Antonio. Dr. Guise received the Fuller Albright Award and the Paula Stern Achievement Award from the American Society of Bone and Mineral Research (ASBMR) in 1999 and 2012, respectively, as well as the Outstanding Investigator Award from the International Bone and Calcium Institute. She was elected to the American Society for Clinical Investigation in 2004, the Association of American Physicians in 2008 and chaired the NIH study section of Skeletal Biology, Structure and Regeneration from 2007-2009. She has served on the Board of Directors for the Paget Foundation for Bone Diseases, the International Bone and Mineral Society and the Council of the American Society for Clinical Investigation, for which she also served as treasurer, and the ASBMR. She held the Gerald D. Aurbach Professor of Endocrinology, at the University of Virginia and the Zachry Chair for Translational Research at the University of Texas. She is currently President of the International Bone and Mineral Society and a Scholar of the Susan G. Komen Foundation. Dr. Guise’s laboratory interests encompass skeletal complications of malignancy: tumor metastasis to bone and the effect of cancer and cancer treatment on musculoskeletal health. She is currently principal investigator in several grant-funded research projects from the NIH, the Department of Defense, Susan G. Komen Foundation and other agencies. Dr. Guise’s clinical interests encompass diseases of calcium and bone metabolism, with a focus on patients with malignancy. She has authored over 150 peer-reviewed articles. Her laboratory has been funded by the NIH, DOD (breast cancer, prostate cancer and neurofibromatosis), Susan G. Komen, Prostate Cancer Foundation, V-Foundation, Mary K. Ash, Institutional funds, pharmaceutical companies and philanthropy. Peyman Hadji obtained his medical degree from the University of Frankfurt, Germany, in 1990, and went on to complete his postgraduate training in obstetrics and gynaecology at the Hamburg Institute of Endocrinology and Reproductive Medicine and the Philipps-University of Marburg, where he received his PD in 2001. In June 2006, he was appointed as a full Professor of Medicine at the Philipps-University of Marburg. Since July 2014, Dr. Hadji is the head of the department of bone oncology, endocrinology and reproductive medicine at the Krankenhaus Nordwest in Frankfurt, Germany. Dr. Hadji is the vice president of the Dachverband Osteologie (DVO) and the former vice president of the German Menopause Society. He is additionally an active member of several osteoporosis societies and oncology societies with a special interest in diagnosis and treatment of bone oncology in women with breast cancer. His current research interest is on the management of women with breast cancer, with a special focus on cancer induced bone loss (CIBL), as well as studies on side-effect management in cancer therapies and outcome research. He is the first author of a recent practical guidance for the management of aromatase inhibitor-associated bone loss. Dr. Hadji is also a co-author of the recently published ESMO practice guidelines on bone health in cancer patients. He is also a co-author of the guidance on the use of bisphosphonates in solid tumours, a consensus recommendation from the second Cambridge conference on advancing treatment for metastatic bone cancer and a clinical experience and treatment recommendation on aromatase inhibitor-induced arthralgia. In addition to this, Dr. Hadji has performed a number of studies on compliance and persistence in oncology and osteoporotic therapies, and is involved in several clinical studies on different pharmacological interventions for osteoporosis including bisphosphonates, denosumab, parathyroid hormones, raloxifene, hormone therapy and tamoxifen - in collaboration with a number of national and international centres. Dr. Hadji is a co-author of the German Osteoporosis Guidelines (DVO) for the diagnosis and treatment of osteoporosis, the German Guidelines for the use of HT in peri and postmenopausal women (DGGG), and the official position statement 2007 of the International Society of Clinical Densitometry (ISCD) for the use of Peripheral Dual-Energy X-ray Absorptiometry in the Management of Osteoporosis. He has published over 200 peer-reviewed articles and book chapters in these fields. 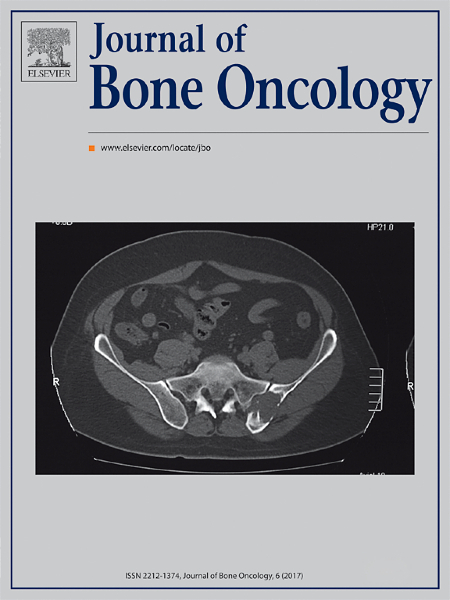 His editorial activities extend to co-editor in chief of the journal of bone oncology and refereeing for a number of national and international journals. Dr. Johnson is currently Assistant Professor of Medicine at Vanderbilt University, where her lab studies the mechanisms driving tumor cell dormancy in bone and the molecular processes that enable disseminated tumor cells to colonize the bone. In particular she is interested in the role of leukemia inhibitory factor (LIF) signaling and hypoxia signaling in breast cancer dissemination and metastasis to the bone marrow. Dr. Johnson earned her doctorate in Cancer Biology from Vanderbilt University, where she studied bone metastatic breast cancer with Drs. Gregory Mundy and Julie Sterling in the Vanderbilt Center for Bone Biology. She then relocated to Melbourne, Australia to pursue a post-doc with Drs. Natalie Sims and Jack Martin in basic bone biology in order to better understand the physiological processes of skeletal homeostasis that may impact upon tumor cells. She then joined Dr. Amato Giaccia’s laboratory as a Postdoctoral Scholar at Stanford University, where she returned to the bone metastasis field. Patricia is an associate professor working in Cancer and Bone at the Department of Biomedical Innovation at the Center for Scientific Research and Higher Education, a research center located in a beautiful ocean town call Ensenada in Baja California, México. Her research interests focus in translational research for the study and treatment of bone metastases and bone disorders. Specifically, she is studying new molecules to treat bone metastases and osteoporosis, their molecular mechanisms, and the use of nanoparticles for drug delivery optimization. Her experience includes broad knowledge of in vitro and in vivo models of cancer and bone diseases. Dr. Conor Lynch is an Associate Member/Professor at the H. Lee Moffitt Cancer Center and Research Institute in Tampa, FL, USA. His research interests center on skeletal malignancies including bone metastatic disease (prostate/breast), multiple myeloma, and osteosarcoma. Specifically, Dr. Lynch studies the molecular mechanisms that facilitate tumor-bone crosstalk and the identification of novel therapeutic targets. To this end, translational efforts focus on the delivery of novel drugs to skeletal tissues and CAR-T-cell design/application. His program is currently funded by the NCI and DOD Prostate Cancer Research Program (PCRP). T.J. Martin is Emeritus Professor of Medicine, University of Melbourne and John Holt Fellow, St Vincent’s Institute of Medical Research. After being Professor of Chemical Pathology at the University of Sheffield (UK) from 1974 until 1977, he was Professor and Chairman of the University of Melbourne Department of Medicine until 1999. He was Director of St Vincent’s Institute of Medical Research from 1988 – 2002. His research has been in bone cell biology, the mechanisms of action of hormones that influence bone and calcium metabolism, intercellular communication in bone and the differentiation of bone cells, and the effects of cancers upon the skeleton. A Fellow of the Royal Society and of the Australian Academy of Science, he has been President of the International Bone and Mineral Society and a Council member of the ASBMR. Among awards were the Dale Medal in 1992 (UK) and the William F Neuman Award in 1994 (USA. He has published more than 600 scientific articles and reviews and 6 books. Dr. Roodman is currently the Kenneth Wiseman Professor of Medicine and Co-leader of Hematopoiesis, Hematologic Malignancies, and Immunology at the Indiana University Simon Cancer Center and School of Medicine. His lab is interested in the role of bone cells in normal and pathologic conditions, in particular myeloma. The Roodman lab performs preclinical and basic studies on the molecular mechanisms controlling bone cell differentiation to identify therapeutic targets for treating myeloma and paget's disease. Dr. Roodman has published more than 500 articles, book chapters, abstracts and editorials and serves on multiple editorial boards for professional journals. Dr. Julie Sterling received her PhD in Molecular and Cellular Biology from the Medical College of Ohio in 2003. After graduating, she began her post-doctoral fellowship with Dr. Gregory Mundy at the University of Texas Health Science Center at San Antonio studying breast cancer metastasis to bone. In 2006, she moved with Dr. Mundy to Vanderbilt University. Dr. Sterling now has a joint appointment as a Researcher at the Department of Veterans Affairs: Tennessee Valley Healthcare System and an Assistant Professor in the Center for Bone Biology at Vanderbilt University. Her lab uses multi-disciplinary approaches including molecular biology, pre-clinical models, engineering, and imaging to investigate how the bone micro-environment regulates tumor establishment in bone and bone destruction with a specific focus on identifying new therapeutic targets. I am a medical oncologist whose clinical and translational research focuses on maintaining the integrity of bone in patients affected by breast cancer. In women with early stage breast cancer I investigate osteoporosis as a toxicity of cancer therapy. In advanced cancer I perform correlative and prospective clinical studies investigating bio-markers, treatment toxicity and novel therapies for osseous metastases. I have performed clinical trials investigating therapies to reduce the risk of skeletal complications of malignancy. I am also involved in researching osteotropism and tumor dormancy with evaluation of proteins and genes associated with the tumor’s potential to metastasize to bone. It is my goal to optimize the prevention, diagnosis and treatment of bone complications in patients affected by cancer. Dr. Weilbaecher is a Professor of Medicine and Cellular Biology and Physiology at Washington University School of Medicine in St. Louis. Dr. Weilbaecher’s translational research focuses on the molecular basis of tumor reprogramming of the bone microenvironment, focused on beta 3 integrin genes: avb3, CD47, TSP1 and P2Y12 and the bone-homing molecules, CXCR4, G-CSF and VLA-1. She has developed numerous clinical trials to treat and prevent breast cancer bone metastases that have directly translated from her laboratory. She highly values training and mentoring, hematology/oncology clinical fellows, post-doctoral fellows, MD and PhD students to perform basic and clinical research into the mechanisms of metastasis and pathologic bone remodeling. She is a practicing breast cancer oncologist and a co-leader of the Breast Cancer Research program at the Siteman Cancer Center.